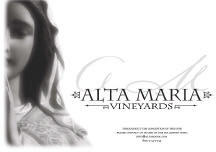 Alta Maria was initially a partnership between winemaker Paul Wilkins (formerly Alban Cellars), James Ontiveros (Rancho Ontiveros Vineyard and Bien Nacido Vineyard) and Sao Anash established in 2005.. In 2012, the Murphy family, who own Presqu'ile Winery, became partners, and wine production for the Alta Maria label was moved to the new winemaking facility at Presqu'ile. 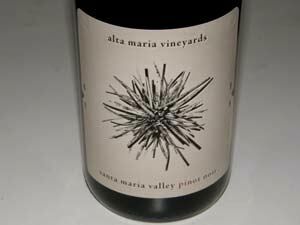 A popular priced Pinot Noir is produced from several Santa Maria Valley vineyard sources and is meant to represent a "snapshot" of the Santa Maria Valley. The wines are sold primarily through a mailing list at with some retail sales. The phone is 805-714-1732.